The Caper Family East of the Cascade Mts. 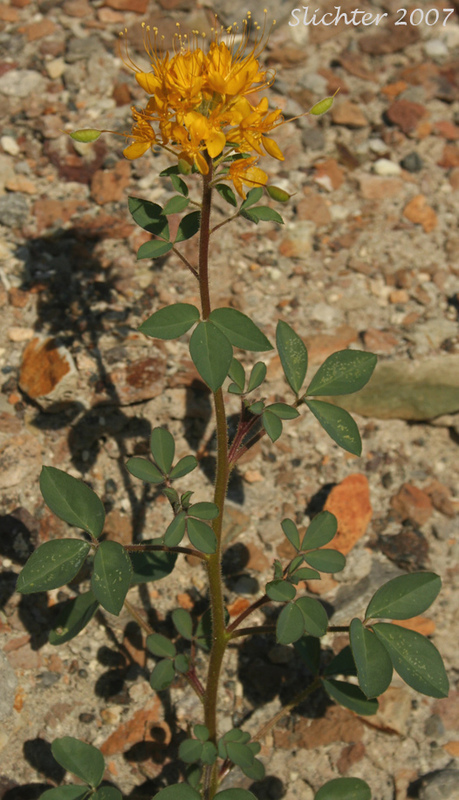 Hillman's Stinkweed, Hillman's Cleomella: Cleomella hillmanii var. hillmanii (Synonym: Cleomella macbrideana) - Fruits less than 7 mm long, as wide or wider than long. Leaves palmately compound, the leaflets less than 3-4 times longer than wide. Flowers yellow. Alkali Cleomella, Twisted Cleomella: Cleomella plocasperma - Fruits less than 7 mm long, as wide or wider than long. Leaves palmately compound, the leaflets at least 5 times longer than wide. Flowers yellow. Yellow Bee Plant: Peritoma lutea (Synonyms: Cleome lutea, Cleome lutea ssp. lutea, Cleome lutea var. lutea) - Fruits longer than 10 mm, much longer than wide. Leaves palmately compound. Plants glabrous to slightly hairy. Sepals up to 3 mm long. Flowers yellow. Fruits elongate and linear. Golden Bee Plant, Golden Cleome, Golden Spider Flower: Peritoma platycarpa (Synonym: Cleome platycarpa) - Fruits longer than 10 mm, much longer than wide. Leaves palmately compound. Plants glandular. Sepals over 3 mm long. Fruits ovate to oblong.